Starter Guide: What Do You Need to Embroider Clothing? Hand embroidery is big in the fashion world. From delicate designs stitched into the collars of t-shirts to bold patterns embroidered on the backs of denim jackets, the ancient artform is popping up everywhere. And if you think embroidery is only about floral patterns, cutesy animals and folksy sayings, think again. Modern embroidery comes in many forms, and anything that can be imagined can be stitched on a piece of clothing. 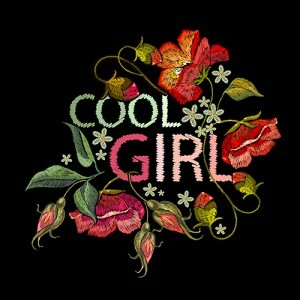 If you are thinking about taking up clothing embroidery as a hobby (or even a business), you are in luck. It is fairly easy to learn and it only requires a few basic supplies. Keep reading to discover what you need to embroider clothing. The fabric your clothing is made of is the foundation of the entire project. You can embroider on just about any type of material, but as a beginner, some are better than others. Ideally, you want something that isn’t too stretchy and holds its shape and structure. Avoid fabrics that wrinkle easily for your first few projects. Something like a plain hat is a good choice for newbies. Canvas totes work well, too. Blank t-shirts work well for embroidery, but the stretchier they are, the more difficult they are to work with. Try embroidering just on the pocket of a pocket tee for your first project to avoid a bit of frustration. Once you have a bit of knowledge and experience, embroidering on stretchy materials is much easier. Also known as floss, embroidery thread is what you use to create your designs. The right kind of thread allows you to embroider with ease and make beautiful creations. Most people start out using stranded cotton threads. They are sold in small skeins rather than on a spool like sewing thread. It is made of six fine threads which can be separated depending on the requirements of your pattern. Many patterns recommend specific brands and colors of embroidery thread. When you are starting out, follow these recommendations for the best results. Without needles, there is no way to stitch a design into fabric. While they share some similarities, you do not want to use a regular sewing needle for this project. Instead, you should pick up a few needles that are specially designed for embroidery. The most important needle for embroidery is the crewel needle. It has a sharp point and a medium-length eye that is slightly larger than the shaft. You’ll also need a tapestry needle, which features a blunt tip and a longer eye opening than the eye of the crewel needle. It has a shorter shaft than the crewel needle but a wider eye. 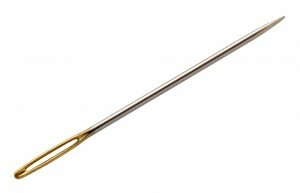 Lastly, you will want a milliner needle. This one has a pointed tip, nearly round eye and a very long shaft. If you have ever seen a cross-stitched wall hanging that is displayed in a round ring, you already know what an embroidery hoop is. The hoop is designed to hold your fabric taut and in place. This helps prevent your embroidery from warping. Wood and plastic hoops are available, and they come in a huge assortment of sizes. You will need a hoop that is appropriately sized for your project and fits comfortably in one hand. It doesn’t have to be large enough to frame the entire pattern. The decision of whether to buy a wood hoop or a plastic one largely comes down to personal preference. Whichever option you choose, though, look for one that is well-made. Poorly made hoops–especially wooden ones–can crack while in use. Round hoops are the most common option, but you may also be able to find square or oval ones. Select the embroidery hoop that makes the most sense for your project. If you are serious about embroidering clothing, the scissors from the dollar store that you have in your junk drawer just aren’t going to cut it–literally! Do yourself a big favor and invest in a nice pair of small, sharp embroidery scissors. 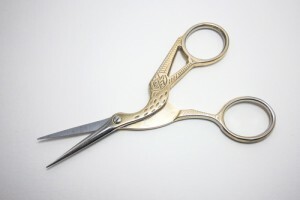 Good embroidery scissors are usually about three or four inches long, and they are exceptionally sharp. The small size enables you to get close to your work, and the sharpness is important for a delicate project like embroidery. They cut thread neatly rather than shredding it, resulting in a much cleaner finished garment. All of the supplies listed above are affordable and easy to find. Head to your local craft store today and start stitching!